Ambition and Shame: Narcissism in the film "Capote"
In a review in the NY Times by A. O. Scott in 2005, Truman Capote is described as “a Southerner in New York, a New Yorker in Kansas, he walks into every new situation sure of who he is and sure that he will soon prove himself to be, once again, the most interesting person in the room.” The film is reviewed as “the story of a writer’s vexed, all-consuming relationship with his work, and therefore with himself. …[His] human connections are, for the most part, secondary and instrumental…. Capote drinks, gossips, teases and whines but mostly he works, with methodical intensity and ruthless discipline”. The movie dramatizes the risk and cost of this work. The writing of the book, his artistic endeavour, takes over Capote’s life. His relationship with the murderer Perry Smith overshadows his relationship with his lover and all others. In Perry Smith, Capote sees something to fascinate his readers, but also a darker image of his own temperament. The movie portrays Smith seduced, betrayed and immortalized by the writer’s attention and, again according to the Times review, “unflinchingly faces the moral abyss at the heart of the journalistic enterprise”. 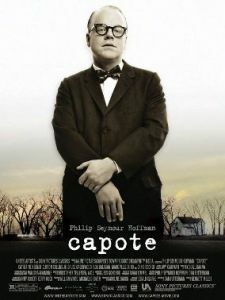 Capote’s great literary success with the book achieved one ambition for him, that of acknowledged, high voltage professional admiration for work that was unique and groundbreaking, in a league by itself; while his abandonment of his moral code meant failure of another, apparently for Capote a more important goal: his ego ideal of goodness and compassion. The arch between these provides the tension in the movie. 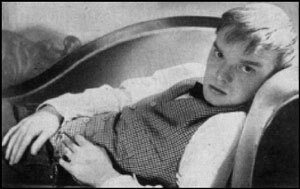 Truman Capote was born in 1924 as Truman Streckfus Persons, in New Orleans. His father was a well-educated ne’er do well from a prominent Alabama family and his mother was a pretty, ambitious young woman who, anxious to escape the confines of her small town, married at 16 and became a mother to Truman at 17. Truman’s earliest years were marked by domestic discord and neglect that left him with painful insecurity and fear of abandonment. His parents divorced when he was four: around the time that his father was imprisoned for fraud. Life with his mother focused on her: on her disappointments, her search for a new, wealthy man, her sexual adventures, her complaints and drunkenness; and Truman’s isolation in a series of hotel rooms while she went out on the town. At six, Truman was sent to his mother’s family in Alabama, where he gained some stability for a brief but profoundly absorbed few years. He credits his “eccentric” southern relatives with fostering his self-acceptance and acceptance of his homosexuality. He was put in the care of four elderly unmarried cousins including his 60-year-old cousin Sook, whom he describes as having had the mentality of a young child. She adored him and celebrated his achievements. He had a baby blanket that she made for him, which he kept with him throughout his adulthood, took with him when he traveled and had with him when he died. It is more than likely that she became a primary attachment figure for Truman: this naïve and child-like woman became the repository for his feelings of goodness and possibility, establishing a template of goodness where others did not recognize or appreciate it, in someone who, from the outside, looked merely simple. He immortalized this cousin in his stories, with warmth and affection, describing her “purity, timidity, her strange, unexpected wisdom”. From her, he learned to look for personal qualities where others did not see them. He lived in genteel poverty with his cousins. His next-door neighbour, who became his best friend, was Nell Harper Lee. Her father owned the local newspaper, wrote influential editorials and practiced law. He was the model for Atticus Finch in To Kill a Mockingbird: a formidable role model indeed and one that both Truman and Nell incorporated as an ego ideal, setting quite a high standard. Both Truman and Harper Lee have stated that Truman himself was the model for the character Dill, the little boy who was the best friend and neighbour of the lead character Scout. She describes him, “ Dill was a curiosity… his hair was snow white and stuck to his head like duck fluff; he was a year my senior but I towered over him. As he told us the old tale his blue eyes would lighten and darken; his laugh was sudden and happy; he habitually pulled at a cowlick in the center of his forehead”. Truman acknowledged, “Harper Lee was my best friend. Did you ever read her book, To Kill a Mockingbird? I’m a character in that book, which takes place in the same small town in Alabama where we lived. Her father was a lawyer and she and I used to go to trials all the time as children. We went to the trials instead of going to the movies”. Trials played a central part in the childhood lives of both of these two authors, who each wrote so differently about trials. Many of the details in Mockingbird are autobiographical. The workings of a legal case would have been familiar to Lee, not only from her father but also from her studies. Lee dropped out of law school after her first year, coming to New York City to be a writer and re-connecting with her old friend Truman. She was fresh out of law school and at just the beginning of her literary career when he asked her to accompany him to Kansas as his “assistant and personal body guard” for what was intended to be just an article for the New Yorker magazine, involving both of them in that notorious Kansas trial (which, by the way, was filmed in Manitoba). While Nell was writing about a positive trial outcome achieved by an idealized father, Truman was intervening and failing to intervene in a different trial, with the end goal being not Justice, but the writing and publication of his book. What happened there and after fore-shorted Harper Lee’s writing career as well as Capote’s. After his mother remarried a wealthy immigrant Cuban businessman, she sent for Truman to join them in New York, on Park Avenue, where he attended private schools. He was adopted by his stepfather and took his last name: Capote. They lived extravagantly. His mother raged against his homosexuality, leading to periods of estrangement between them. When he was 30, his stepfather was imprisoned in Sing Sing for embezzlement, leading to his mother’s suicide. Kernberg writes about the development of narcissism as born from chronically cold parental figures with covert but intense aggression: callous, indifferent, nonverbal, spiteful aggression. In extreme cases, the child is possessed of some inherent quality, some attractiveness or talent, which arouses the parent’s envy. The talent then becomes a refuge for the child and the grandiosity becomes a cover for the shame. From the beginning, Truman escaped into literature, teaching himself to read and write before he started school. At age 5, he was often seen carrying his dictionary and his notepad. Truman declared from the age of 11 that he was going to be a writer. He recalled, “ I began writing sort of seriously when I was about 11. I say seriously in the sense that like other kids go home and practice the violin or the piano or whatever, I used to go home from school every day and I would write for about three hours. I was obsessed with it.” He received recognition from a writing contest at age 12. At 17, he left school and started working at the New Yorker magazine, where he attracted attention for his eccentric style of dress: “I recall him sweeping through the corridors of the magazine in a black opera cape, his long golden hair falling to his shoulders: an apparition that put one in mind of Oscar Wilde in Nevada, in his velvets and lilies”. Uncharacteristic for his time, he was open about his sexual orientation. He cultivated friendships with influential people. Truman was fired for offending Robert Frost by walking out of his reading. Capote’s early short stories are poignant and powerful. I recommend them to you. At 24, he published an autobiographical novel, Other Voices, Other Rooms, about a son’s search for his father, which he said was “an attempt to exorcise demons”. He said of his father, that he was “..in the deepest sense … non-existent” and that the book was his “search for the existence of this essentially imaginary person”. The book was extremely well received. The best friend of the protagonist was based on Harper Lee. He began his long-term relationship with Jack Dunphy, author, playwright and former professional dancer who was 10 years his senior. Dancers tend to have beautiful bodies, bodies that are a source of pride, not bodies that are an oddity, like Truman’s. Capote began traveling in search of inspiration. Despite his heavy socializing, he maintained a rigorous writing schedule. Breakfast at Tiffany’s was made into a movie and two of his works were made into Broadway productions. He wrote successful screenplays including Beat the Devil with John Huston, and adapted Henry James’ The Turn of the Screw for the movie The Innocents. By the late 1950’s, he was no longer interested in writing about his own life experiences. When he read in the newspaper about the Kansas murders, it offered a chance for him to explore something new and focus on a new form of writing that he wished to develop: the “non-fiction novel”. He was looking for a subject of “sufficient proportions…something very special”. When he saw the article in the newspaper, he recalled later, he thought, “Well, that will be a fresh perspective for me.” He was attracted to a setting, Kansas, that he knew nothing about. He was curious about the mystery of the murders and wanted to figure out what had happened. He liked the “strange ordinariness”. But when the murderers themselves were apprehended and became part of the story, he shifted from “what happened” to “why”. The new literary genre that he created was placed somewhere between reality and fiction, like the persona that he created for himself. The concept of the ego ideal originated with Freud. He viewed it as the sum of positive identifications, an awareness of potentials and goals. It is the loving and comforting counterpart to the judgmental, punitive super ego derived from internalization of the parents. It is the self-as-I-want to be. Shame results from failure to attain this goal. Since the ego ideal contains narcissistic omnipotence, the achievement of one’s most cherished images of success, shame represents a narcissistic reaction to that failure. It represents a decrease in narcissistic self-esteem, the failure to achieve one’s expectations of oneself. With shame, the self is experienced as defective or inadequate: the self itself has failed. Andrew Morrison wrote extensively about shame in his Essential Papers on Narcissism, 1986; and The Culture of Shame, 1996. He delineates the difference between guilt and shame. Guilt results from a transgressive action. Stemming from an act or choice, it refers less globally to the self. The danger of guilt is punishment. Shame results from something involuntary. With shame, the self is experienced as defective or inadequate: the self itself has failed. Shame reflects feelings about a defect in the self, an attempt to deny, cover or hide that failure: to run from it. Humiliation. Mortification. Remorse. Apathy. Embarrassment. While guilt may lead to punishment, shame threatens abandonment and rejection because the self is not worthy. Anxiety about the potential for shame can cause one to recoil from others. Shame often reflects a bodily function and comparison of oneself to others. Capote was 5’3”. He had a high-pitched, lisping voice. His pinky fingers were abnormally large. His physical appearance was an unavoidable oddity. The murderer Perry Smith had a physical appearance, not so clearly portrayed in this film, which was deformed. Perry was well built, with a strong upper body, but shriveled legs from a motorcycle accident that broke them. He had chunky, dwarfish legs broken in five places, scarred and chronically painful, leading to aspirin addiction. He had “girl-like” feet and hands. According to Kohut, the narcissistic self is the source of ambition: the exhibitionistic wish to be looked at and admired. The maintenance of self-esteem depends on the admiring self-object and the opportunity for merger with the idealized one. Ambition can be the compensatory attempt to hide the defect, often perceived as a defective body part, by merging with the idealized other or the ego ideal. The deep sense of unworthiness and fear of rejection is channeled into a hunger for response and reassurance, a need for mirroring and merger. Even if one succeeds in achieving this ambition, it is fearful because the narcissistic person does not believe that they really are worthy and really deserve the praise that they have garnered. The more the praise, the more they fear exposure for the fraud that they believe themselves to be. They must up the ante continuously, with ever greater grandiosity. At the earliest stage of development, the caretaker, often the mother, fails to mirror adequately, fails to provide the unconditional availability of approval, mirroring, admiration and merger. Failure at this point can lead to total breakdown of the self into disintegration and fragmentation such as in psychosis. At a later stage, a caretaker, often the father, fails to respond empathically to the child’s wish to idealize and merge, turning away the child’s efforts and accomplishments. This leads to feelings of emptiness, enfeeblement, and depletion of the self. The earlier stage creates the ambitions, the wish to do something that is seen and admired. The later stage creates the ideals: the wish to BE that stupendous person who can do those things. The self must succeed with at least one of these two stages to create a cohesive, non-fragmented self. Otherwise, defenses arise to make up for it by increasing the pursuit of compensatory achievement, to bolster self-esteem. The enfeebled self creates the grandiosity as a place to hide. The parent must affirm the child’s healthy exhibitionism and allow and accept the child’s identification and merger. Failure to respond to the child’s appropriate exhibitionism results in an absence of ambition and ideals. Shame results from critical judgment of what the child has done: failure by the parent to affirm the child’s creation. The fear of rejection can be transformed into healthier compensatory ideals and achievements, but recurrent failure to achieve the desired parental response leads to feelings of emptiness. The individual cannot attain self-acceptance and cannot believe that anyone else would accept them. The difficulty disrupts close, meaningful relationships. Guilt can lead to the wish to confess and come out in the open; but shame leads to the wish to withdraw, cover-up and hide. Capote was driven by his ambition. All else was sacrificed to it. We know that his mother had not mirrored him and that his father had not been there for idealization and merger. Neither necessary stage in his development was accomplished successfully. Ambition would be his attempt to compensate for his shame. One can speculate that he felt compelled to create a marvel, both in his writing and in his own persona, which was as much a creation as was his writing. In his reportage, using the techniques of fiction, he adopted a personage that both was and was not himself. He was his own invention. It was crucial to Truman to be seen and admired, in the flesh and on the page. With his non-fiction novel, In Cold Blood, he succeeded. He riveted the literary and intellectual worlds. But there was that part of him, the part that was raised by the good, simple cousin Sook, the part that incorporated Harper Lee’s father as someone to emulate, that part of Truman that had an ego ideal of goodness, honesty, fairness and justice. The movie first shows us Truman at a cocktail party, discussing the writer James Baldwin and telling a story about Baldwin who, despite being “a very nice man”, in Truman’s opinion is lacking in honesty with himself and his readers. Truman states that he himself is always honest in his writing and that he does not ever lie. As the plot develops, we see him sink in his lies. By his own reckoning, Capote did not remain true to his code when he did what he did to write and finish the book. Midway, when he is instrumental in finding a lawyer for the murderers’ first, successful appeal, it is at least in part because he wants justice and believes that they did not have fair and proper representation. The appeal also serves his own purposes, but he seems sincere in his desire to write a book that will show Perry’s humanity and will not allow the world to dismiss Perry as merely a “monster”. There is at least a part of him that really connects with Perry. As time passes and events play out, Truman failed to follow the moral principles and ideals that he had incorporated. He judged himself a failure. The more that he was acclaimed, the more he felt like a phony. To his mind, the person being celebrated was a creation put together to achieve an ambition: it was not the real him. He was praised for what he did, but in his own eyes and the eyes of some others, he was damned for who he was and what he had become. That failure to live up to his internalized ideal was his narcissistic failure. After In Cold Blood, Capote never finished another novel. He worked for years on Answered Prayers, publishing some chapters in Esquire magazine and outraging his society friends with his unflattering portrayals and betrayal of confidences. The title is in reference to a quote by Saint Teresa of Ávila: “Answered prayers cause more tears than those that remain unanswered”. He lost most of his friendships and his relationship with Jack Dunphy. His depression, excessive alcohol and drug use disrupted his writing. He died in 1984, age 59, at the home of his friend Joanne Carson, ex-wife of Johnny Carson. He had with him the baby blanket that cousin Sook made for him back in Alabama. We can look briefly at the more primitive and psychotic narcissism of Perry Smith. Perry’s childhood was more chaotic and violent than was Capote’s, and Perry did not have the saving grace of someone in his life like Cousin Sook. Perry had been abandoned by his father, his primary attachment figure, and left in the care of his negligent, alcoholic mother. When he ran away to his father, he was returned to his mother, but she threw him out. He spent only a short time in an orphanage, due to his unmanageable behaviour. From there, he was sent to a religious establishment, where the nuns physically abused him for bed-wetting. Then, the courts returned Perry and his siblings to their father, who could not manage to provide for them financially and accepted only Perry. He would abandon Perry for hours or even weeks without telling Perry when he would return. As pressure mounted on his father, he took to verbally and physically abusing Perry. any interaction he was involved in, no matter what horrible thing he might be doing, was accompanied by a wish for acceptance. What Perry experienced as a child when he looked to an authority figure for acceptance, admiration and merger, was repeated, outright brutal rejection. Years later, when he looked at his intended robbery victim, a bound and helpless Mr. Clutter, Perry found that he liked him and thought that he was a good man. Perry wanted Mr. Clutter to like him back, to accept him and think well of him. Even at his execution, Perry sought out and shook the hand of the investigator who caught him, in a friendly manner, saying “nice to see you”, as if the simple act of recognition implied acceptance even though he was recognized for something horrible. He asked if any members of the Clutter family were present for the execution, as if his murder of their parents and siblings made him a part of their social circle, made him known and accepted and he wanted to say hello. To Perry, any interaction he was involved in, no matter what horrible thing he might be doing, was accompanied by a wish for acceptance. Instead, what he saw in Mr. Clutter’s eyes was that Mr. Clutter expected the worst from him, had a low opinion of him and expected Perry to kill him. Perry could not stand the shame of this “nice man” thinking badly of him. When Mr. Clutter looked into Perry’s eyes, the rejection and low expectation exploded the lid from all those earlier rejections and shamings, and propelled Perry into the mindless rage that he felt as a helpless child, when he fragmented and dissociated. He acted, murdered, without conscious thought, not even aware of what he was doing; afterward finding it puzzling that he did it and that he did not feel guilt or remorse. His extreme narcissistic shame and failure pushed him into a psychotic break. When Alvin Dewey, Head Branch Detective of the Kansas Bureau of Investigation, took on the Clutter murder case, it consumed him too. He could not sleep. He lost substantial weight. He became unkempt. One wonders what would have happened to him if the murderers had not been caught, had slipped through his fingers in the end like they did in the beginning: if he had failed. Would he have been able to let it go? But they were caught. He caught them, with his vigorous efforts. He saw the case to its end. His ambitious belief in himself told him that he had to get it done, that he could do it, and carried him through, to its accomplishment. But his intensity of determination suggests something driven. There are many shades and degrees of narcissistic ambition, healthy to unhealthy. In Cold Blood brought Capote critical and financial success but it was his ruin. After, he wrote little, and it was not well received. His personal life became a disaster. Nell Harper Lee, seeing the cost to her friend Truman in creating his best seller, never published another book herself. She apparently decided that the costs of art are too great for the artist. She abandoned the book that she had been working on. Writers try to balance their artistic ambitions with their obligations to the world, and they suffer for it. They also must balance their obligations to themselves. The movie presents a compelling story about the mutual and sometimes exclusionary demands of art and life and the narcissistic belief that we can have it all. The director, Bennett Miller, was waiting for the perfect script with which to make his feature film debut. This was his first feature film. The script for Capote came from Miller’s friend Dan Futterman, with whom he had kept in touch since their days together in middle school. They had known each other since childhood. Futterman is also an actor. He played the son of Robin Williams in The Birdcage, and more recently Daniel Pearl opposite Angelina Jolie in A Mighty Heart. He is now an executive producer on In Treatment. Together, Miller and Futterman sought out Philip Seymour Hoffman for the lead. They had met him in summer theatre camp when they were 16, had big dreams and big, healthy, narcissistic ambitions.